For Spencer Smith, being the youngest men’s world triathlon champion isn’t his biggest accomplishment. Nor was it becoming the first man to win back-to-back world titles, in 1993 at Manchester, England and in 1994 at Wellington, New Zealand. Smith views his win at the 1992 ITU Triathlon Junior World Championships as the most satisfying result of his triathlon career. Smith, was born in West Middlesex, Great Britain and grew up a swimmer. But he eventually grew tired of doing laps in the pool and a friend suggested triathlons. After Smith won the junior championship on his third try, at the age of 19, he turned his attention to the elite men’s competition. When he won the 1993 world championship he felt like he had made it. 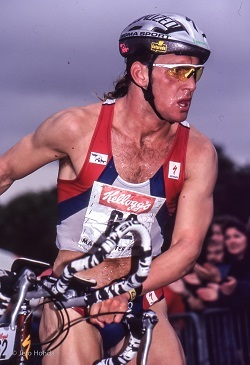 Smith became the youngest ITU World Champion, winning at 20 years, 3 months and 11 days,just under two months younger than Miles Stewart was when he won in 1991. Smith said the championship pressures and pitfalls that plague athletes, such as complacency, affected him during the 1994 campaign. But the ‘94 season taught Smith some life lessons that he still employs today. The ’94 title was more important for him and his legacy as a triathlete, Smith said. “People could have thought that maybe ‘93 was just a fluke, so I think the [‘94] championship validated me as a legitimate champion,” he said. Smith has fond memories of time in triathlon. When Smith looks back on his successful career, he said he feels that his three-year quest for his junior championship is what helped him the most.